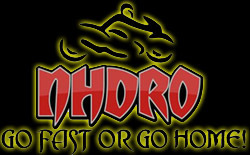 It may have taken a full month to deliver, but Mother Nature and Steve Earwood’s Rockingham Dragway track prep crew laid out a record setting buffet for Mickey Thompson MIRock Superbike Series racers to feast on in the rain-delayed opening round of the 2013 season. The April 19-21 FBR Shop Spring Bike Open also saw it’s fair share of drama and rising underdogs, as none of the pro class champs made it to the finals, let alone the winners circle. Three-time Orient Express Pro Street champ Rodney Williford qualified number 1 with a 6.99 and seemed destined for a final round showdown with rival Joey Gladstone of DME Racing. But Williford—who’s trying mightily to be the first Pro Street bike in the 6.80s—wheelied wildly on his turbocharged, purple “Nitrous Bike Eater” Suzuki Hayabusa and was unable to chase down Doug Gall in the other lane. That seemed to open the door for Gladstone to gain some valuable, early season points on Williford. Gladstone was on a MPH record-setting tear, hitting 212.33 in qualifying and a whopping 214.89 on raceday. He had a bye to the final and needed only to start his motorcycle and take the tree under power…easy, right? Not so much. Try as they might, the DME crew could not get the black and blue ‘Busa fired. That handed the win to the unheralded, number 3 qualifier Gall. Through breakage, redlights, and Williford’s struggles, Gall was the last man standing, and standing right smack in the winners circle. The Ohio racer is hitting the entire MIRock Series this season and plans to collect more victory hardware. DME Real Street champ Johnny “Turbo” Dobrin wasn’t even as fortunate as Williford. A see-saw qualifying battle with Jeremy Teasley saw former champ Teasley pip his rival Dobrin with a way-quicker-than-the-record 7.705. No problem, raceday is another day, right? It turned out the highlight of Dobrin’s race weekend was behind him as he launched his Exoticycle turbo ‘Busa way early in round 1. “I don’t know why I did that,” Johnny Turbo said about his redlight foul start. “I’d been having terrible lights all weekend, maybe that was on my mind.” The early out meant more anniversary time for Dobrin and his wife Charisse. Teasley raced his way to the final, where he faced RS Motorsports teammate Chris Moore in an all-nitrous, Kawasaki ZX14 final. Teasley’s .040 starting line advantage would prove key in this race, as Moore’s quicker 7.86 was unable to drive around Jeremy’s 7.88. 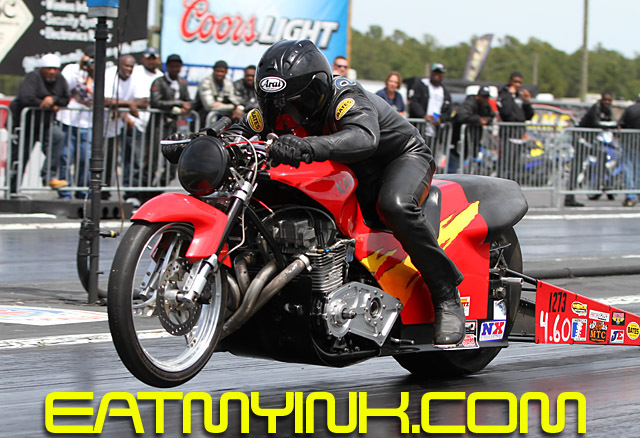 Teasley spent a good chunk of time over the weekend setting an unofficial record that has set the motorcycle drag racing community on fire. 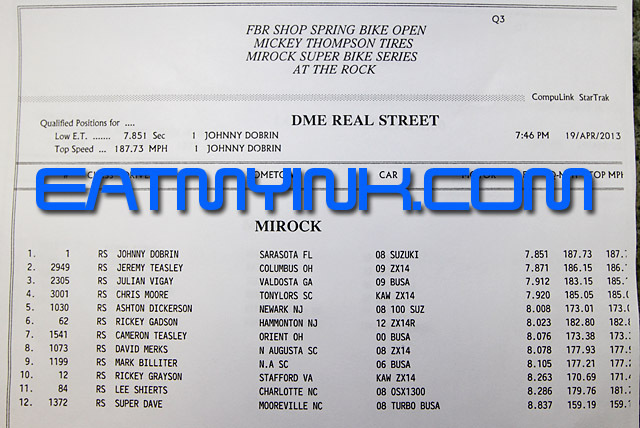 Over the winter, a group of competitors (including Teasley) started an online smack talking campaign about who would be the first to run an 8.60something on a foot-shift, stock wheelbase, stock motor, no weight added, no MSD SB6-equipped, Kawasaki ZX14R. With the bike entered in Crazy 8s and ET, Teasley chipped away at it on Saturday, running 8.702, then 8.701. Finally it came, an 8.69 followed by an 8.67. 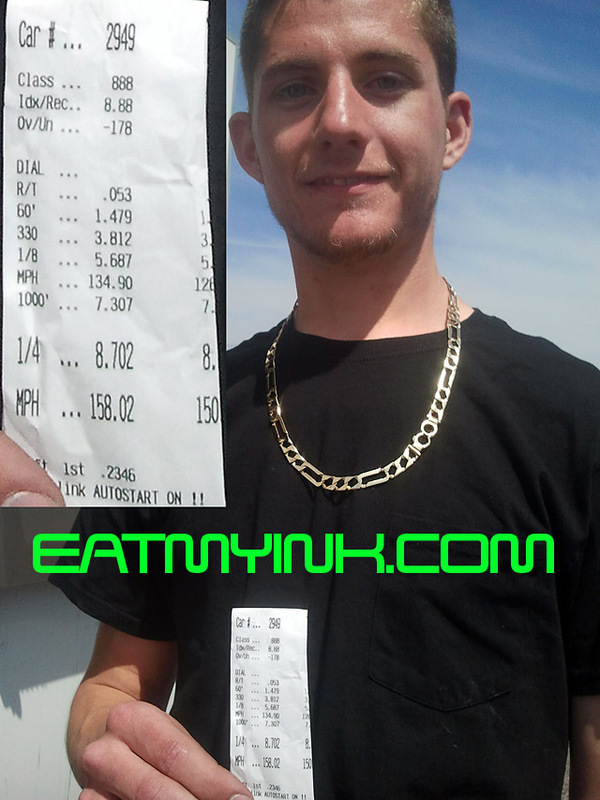 Sunday morning, though, is when Teasley really knocked it out of the park with an unbelievable 8.62. Lest Jeremy be the only heralded member of the Teasley family, younger brother Cameron won his first ever Crazy 8’s race on the CarrCraft Racing Hayabusa. His .043 light gave him a big cushion over runner-up veteran Barry Pryer Sr. Cameron also ran his first ever 7 second pass this Saturday on his Real Street bike, making it a milestone weekend for the young Ohio racer. Although Knight—yet another Ohio-based racer—failed against Baumbach in 5.60, he prevailed against Mooresville’s Chase Sandefur in Sunday’s Brock’s Performance Street ET final. Virginian Michael Herman Jr. won the class over Stanley Russell on Saturday. Herman’s dad, obviously named Michael Herman Sr, won Nitrous Express Pro ET on Sunday over Alan Fields. Saturday’s Pro ET race saw the former perennial bridesmaid Terry “T-Bone” Singleton of Georgia don the big, white dress with his win over Mike Rankin, who himself scored the $500 Nitrous Express bonus for winning the most rounds over the whole weekend. Kenny Cornell won the inaugural Louis Concrete 4.60 index class final over Shubby Claytor. Surprisingly, it was also the first win ever for Virginia veteran racer Cornell. Tennessee’s Jerry Turner won Trac King/APE Top Sportsman over defending class champion Boo Brown. 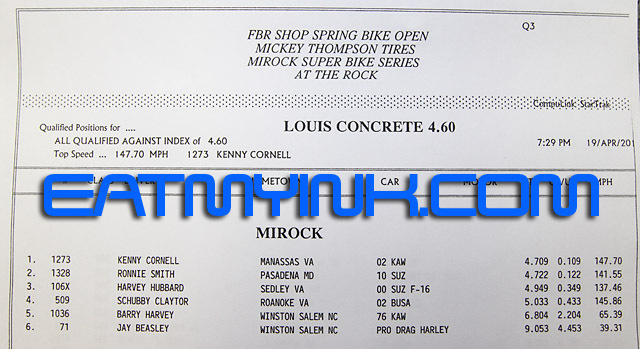 All of these competitors will have little time to prepare or repair their mounts for the next Mickey Thompson MIRock Superbike Series event, which happens this weekend, April 26-28, with the Fast By Gast Spring Nationals at Maryland International Raceway in Budd’s Creek, MD. 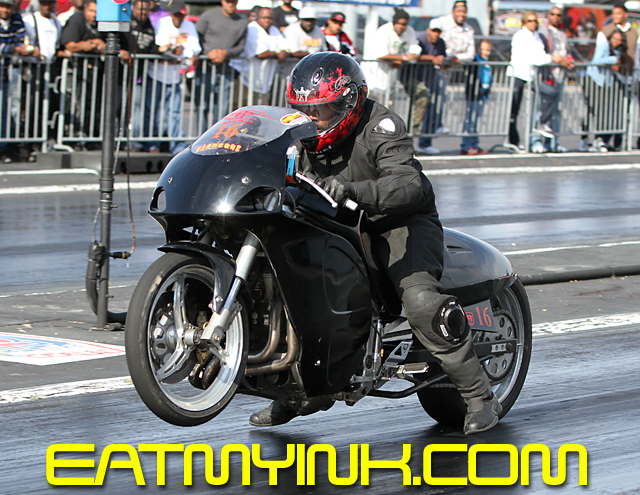 3X Orient Express Pro Street champ Rodney Williford is starting the season off right! 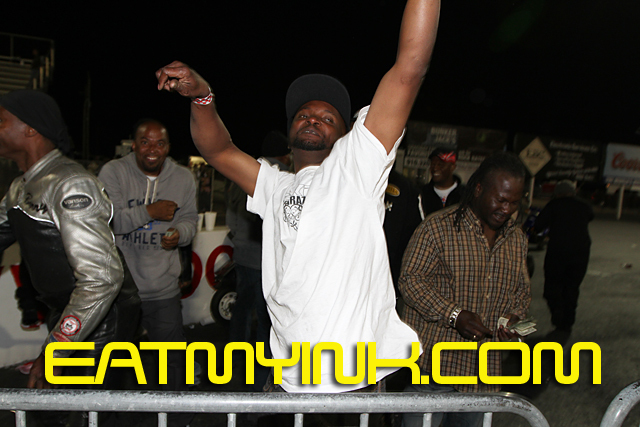 DME Real Street champ Johnny “Turbo” Dobrin. MORE PHOTOS! As if a four week rain delay didn’t boost the excitement surrounding the start of the Mickey Thompson MIRock Superbike Series enough, Rockingham Dragway owner Steve Earwood has added a Sunday morning qualifying session for all those racers who might have had a prior commitment on the rescheduled date. 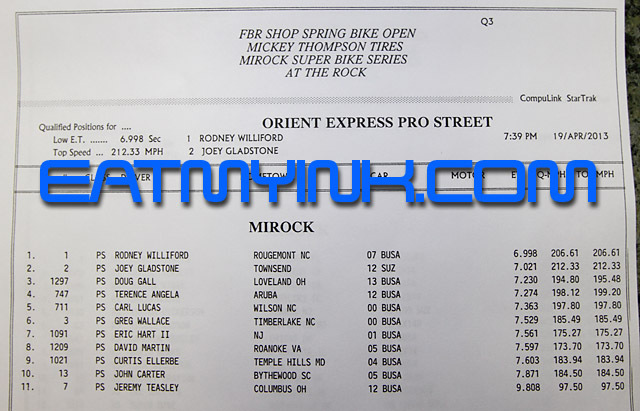 The adjusted schedule for the April 19-21 FBR Shop Spring Bike Open includes one professional qualifying run on Sunday morning at 10 for Orient Express Pro Street, DME Real Street, Louis Concrete 4.60 and FBR Shop 5.60. 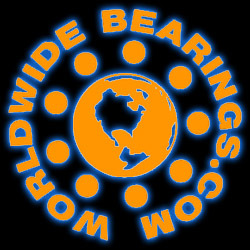 “With a plethora of bike events over the past three weeks I feel it is only fair to allow those Pros who cannot attend on Saturday to have an opportunity to qualify on Sunday morning, along with all entries in the affected classes,” Earwood said. Three-time Orient Express Pro Street champ Rodney Williford, DME Real Street champ Johnny “Turbo” Dobrin, Trac King/APE Top Sportsman and Brock’s Performance Street ET champ Boo Brown, Crazy 8’s champ Shayne Proctor, FBR Shop 5.60 champ “Fearsome” Andy Baumbach, and Nitrous Express Pro ET champ Dale Hamilton are all expected to defend their titles against a throng of challengers as the season kicks off in the beautiful Sand Hills of North Carolina. Orient Express Pro Street champ Rodney Williford. MORE PHOTOS! 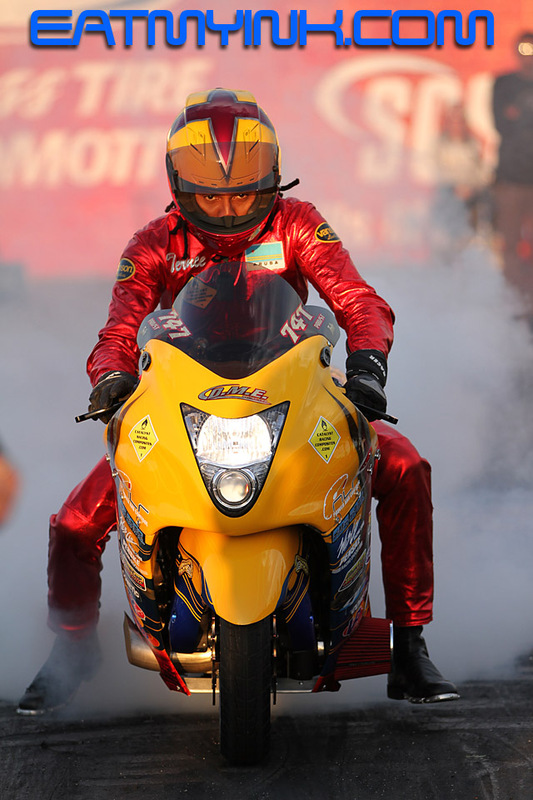 “I’ve made no changes to the bike, just trying to start the season off as it ended last year,” said Williford, who has one win under his belt at another track already this month, and has to be the odds on favor to repeat on his turbocharged, purple “Nitrous Bike Eater” Suzuki Hayabusa. Trac King/APE Top Sportsman and Brock’s Performance Street ET champ Boo Brown. MORE PHOTOS! 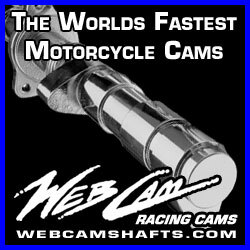 In addition to the on-track action that will rage all weekend, these champs will also collect their unique 2012 championship apparel and trophies showing they are the best of the best in the world’s largest motorcycle drag racing series. Many of these and other heavy hitters will arrive on Friday for early bird testing, beginning at 10am, and test and tune for all competitors during the evening at 6pm. Qualifying for Orient Express Pro Street, DME Real Street, Crazy 8’s, Louis Concrete 4.60, and The FBR Shop 5.60 will be begin Saturday at 1pm. 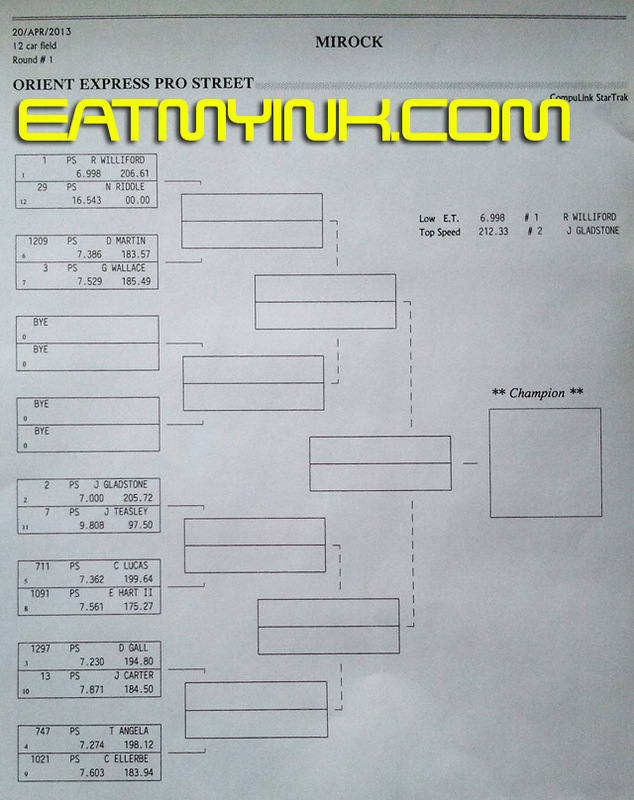 Trac King/APE Top Sportsman and Nitrous Express Pro ET trials begin at 10am, followed by Brock’s Performance Street ET. Grudge bikes will follow each Pro session and the popular “Afterdark Underground” will follow the end of Pro qualifying on Saturday. Time trials will follow Chapel Service on Sunday at 10am, with Pro eliminations scheduled to begin at 11:30. The weather looks great this time around! We’ll see you at The Rock! An extended winter weather pattern and deteriorating forecast have forced Rockingham Dragway owner Steve Earwood to impose a one-month delay to the start of the 2013 Mickey Thompson Performance MIROCK Superbike Series which was to have begun this weekend. New dates for the FBR Shop Spring Open, which was to have kicked off the nine-race series hosted by Rockingham Dragway, Maryland International Raceway and Atco (N.J.) Dragway, are April 19-21. The race program will remain unchanged with a MIROCK-exclusive test-and-tune session on Friday (April 19), pro qualifying Saturday and eliminations Sunday in all the popular MIROCK categories plus the new Louis Concrete 4.60 Index class. Rockingham also will host its popular Afterdark Underground program following Saturday’s qualifying. All the usual suspects in Orient Express Pro Street, D.M.E. 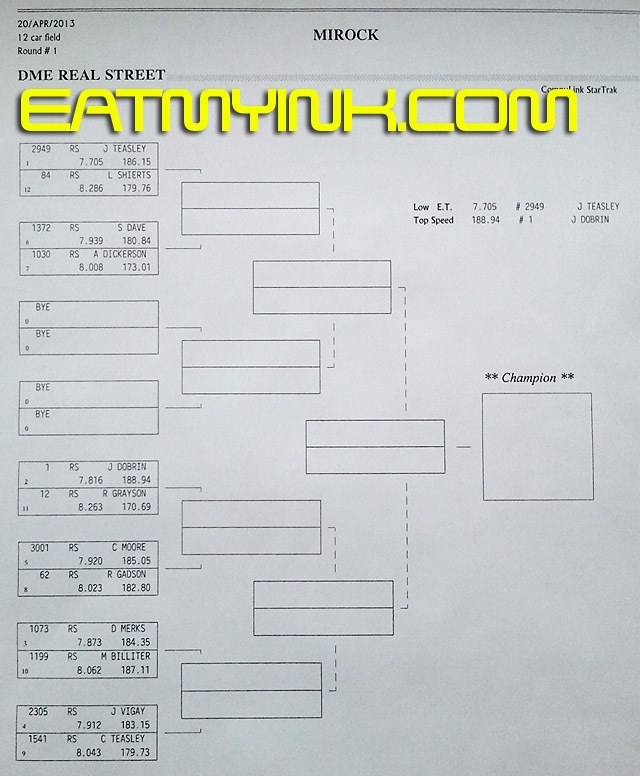 Real Street, MIROCK Crazy 8s, FBR Shop 5.60, Trac King Top Sportsman, Nitrous Express Pro ET and Brock’s Performance Street ET are expected to return for the belated opening event in one of the nation’s most successful independent series. “It’s very disappointing to have to postpone a race of any kind, but especially one of this magnitude,” Earwood said. 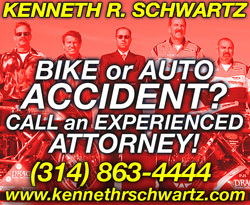 “Unfortunately, one of the realities of drag racing is that we are at the mercy of the elements and in a series like this one that draws racers more than 20 states, you have to be sensitive to more widespread travel issues. It would not be prudent to force racers to drive here knowing we stand more than a fifty-percent chance of facing a rain-out. As it has in the past, The Rock will play host to four events in the series while MIR will host four and Atco one. Two of Rockingham’s events will focus exclusively on the expanding sportsman classes – The Adams Performance Sportsman Summer Sizzler, June 28-30, and the dragbikelive.com Sportsman Showdown, August 9-11.